I remember when I started all of this travel blogging that my mind was wired in a completely different way. I was so keen on visiting huge European cities and attend pool parties and take amazing beach photos. After a while, I discovered that the internet is full of pretty much every location there is. Last year when I went to Slovenia was the first time I experienced a different type of travel. One where you can relax and enjoy the nature without too much stressing and TripAdvisor researching. The photos that came out of that were beautiful and to this day it’s my most read blog post. This is why I am so excited to be making this blog post. 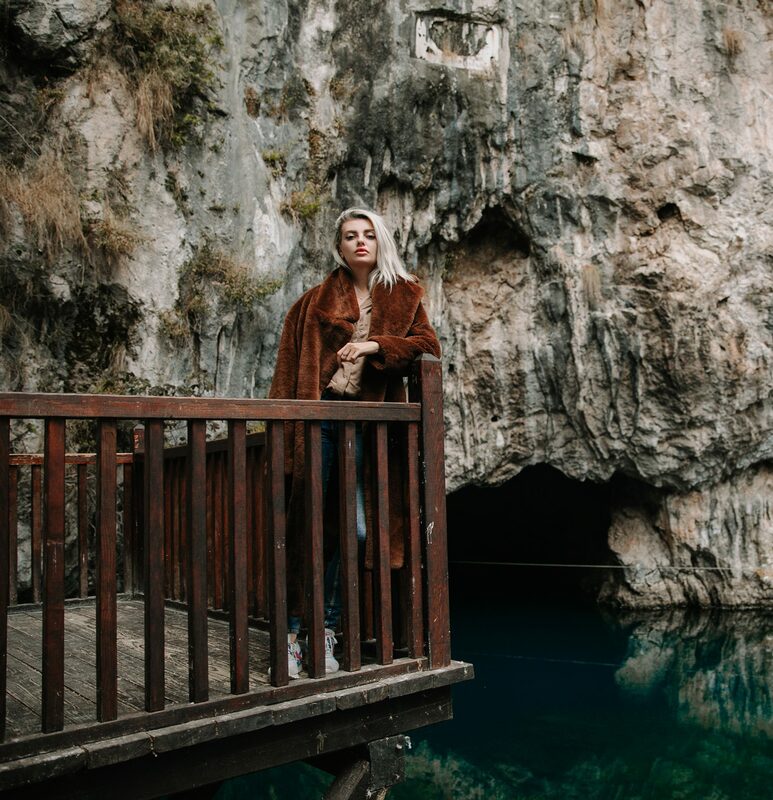 In my last one I took you to Mostar, but just a couple of minutes away from Mostar, there is this wonderful village called Blagaj. Settled underneath the mountain, it dates all the way back to 15th century. As we walked up the river we were stunned by the amazing nature and surroundings of this lovely little place. We were really excited to visit the Dervish house at the bottom of the mountain. There are many cute little restaurants where you can sit and eat or just drink coffee and take it all in. Blagaj is a village-town in the south-eastern region of the Mostar basin, in the Herzegovina-Neretva Canton of Bosnia and Herzegovina. It stands at the edge of Bišće plain and is one of the most valuable mixed urban and rural structures in Bosnia and Herzegovina, distinguished from other similar structures in its urban layout. Blagaj was most likely named for its mild weather patterns since blaga in Serbo-Croatian means “mild”. Blagaj is situated at the spring of the Buna river and a historical tekke (tekija or Dervish monastery). The Blagaj Tekija was built around 1520, with elements of Ottoman architecture and Mediterranean style and is considered a national monument. Blagaj Tekke is a monastery built for the Dervish cults. In order for us to go in and see it for ourselves, we had to respect the rules and cover our legs and heads. As this is a religious establishment of Islam. Dervish house has been nicely kept throughout the years and follows a very recognisable pattern. We were lucky to have gone in the morning, because a storm was coming our way, and by the time we got to the car the wind was so strong, I don’t think I’ve seen anything like it. We took a short drive above the Dervish house to see the fort. Unfortunately, we weren’t able to climb up due to the bad weather, so we just looked at it from the bottom. I think photos speak louder than words. If you are near Mostar, make sure to come and visit this unique little village.